After two straight months of weekly (big) snowstorms, spring finally let loose on my area. And it did so with abandon! Overnight, there were leaves on previously barren trees. The land changed from shades of brown and grey to full greens and blues. I've spent every free minute this week chasing wild foods, and nibbling my way across the land. Asparagus has boomed. I came home with just shy of eight pounds of it yesterday. Morels are also starting to trickle into my kitchen. But I've not forgotten about our friends, the mustards, the featured plants of Wild Things this month. I can't take a step in any direction without spotting at least four different kinds of mustard plants. 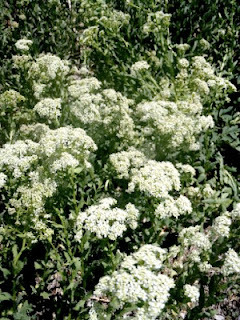 This year, I've come to appreciate one in particular, Lepidium draba (formerly Cardaria draba), also known as hoary cress, or whitetop. 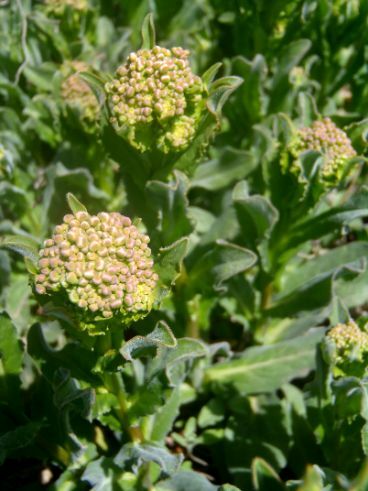 I noticed that in the early stage of flowering, while the flower heads were still tightly closed, that it somewhat resembled broccoli rabe. Naturally, I tried cooking it up simply, in the manner of broccoli rabe, with olive oil, garlic, and red pepper flakes. I found it to be delicious! 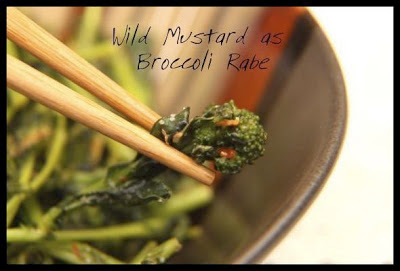 It is even milder than broccoli rabe, possessing a slight bitterness and mustard flavor, while still being pleasantly green and friendly to the tongue. If you can't find L. draba for this dish, use whichever mustard you have locally that looks similar, with meaty stems and flower heads that are still tightly closed. L. draba has lance-shaped leaves that have a slightly blue-gray cast. The basal leaves are attached to the stalk by a short petiole, but all the upper leaves are clasping (sessile). The plant has many small white flowers, that have four petals characteristic of the the mustard family. L. draba can grow to be 1-2' tall, but at the stage when it is perfect to eat, it is usually 6-8", in my experience. It is considered to be an invasive species in the US. 1. Bring a medium pot of water to a boil. When the water reaches a strong rolling boil, drop in the hoary cress. Let it boil for a minute, then drain away the water. 2. In a heavy-bottomed skillet, heat the olive oil over medium heat. Once the pan and the oil are hot, add the minced garlic, and stir it until it becomes fragrant, only 30 seconds. 3. Add the blanched L. draba to the garlic and olive oil. Stir. Add the red pepper flakes and salt, and continue to stir the hoary cress until its edges take on a slight brown, about 5 minutes. 4. Turn off the heat. Splash in the vinegar, and stir it around. Adjust the salt, if necessary. Serve immediately. *There are several places in the online literature that say that young leaves of Lepidium draba contain hydrogen cyanide. Trouble is, these sites seem to repeating the same information, word for word, in a way that is nonspecific. You see, sometimes when people write about foraging, but don't have any actual experience with the plant, they tend to repeat any cautions that they see. I don't disagree with this, as it is indeed better to be safe than sorry. However, in my research, which included asking my foraging mentors, I didn't find any definitive evidence that this is actually the case. I've eaten quite a bit of this plant this year, and have suffered no ill effects. Also, this recipe calls for hoary cress which is nearly in bloom, which means it is no longer "young." As a caution, I've included the initial boil and removal of water for L. draba. 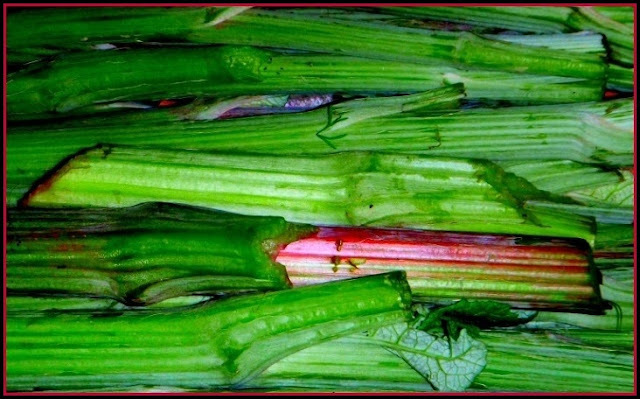 This is often recommended for wild foods to remove unwanted aspects of the food. 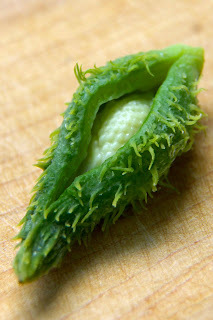 All I can tell you is to eat this plant with these things in consideration, and also noting that every body reacts to every food differently. It is always wise to consume wild foods in moderation. Hang on, I think I've got that one growing all over. You mean I can eat it? Mind blown. Why did I just pay so much for broccoli rapini? If you've got it, it probably is all over, due to its invasive nature. We used to eat broccoli rabe all the time growing up, but not so much anymore. My friends haven't heard of it, for the most part. I'd love to eat a wild version, and be taken back to those times, especially in a sausage sandwich. In a sausage sandwich? You're speaking my language! Does it taste like brocolli? Not exactly like broccoli. It has a bit of the smell you associate with plants in this family, but it is neither strong nor bitter. Thanks B. This is perfect timing, as I just gathered a bag full of the unopened flower head clusters from a big field of whitetop. It makes me sad to see the stuff growing so abundantly, because I wonder what other plants would be there if L. draba hadn't taken over, but I'm looking forward to eating it at least. A note on your comment about trying other mustards in this style: I tried field pennycress (Thlaspi arvense) in similar fashion, but found the taste so strong as to be inedible. So it might be a trial-and-error sort of thing insofar as trying the dish with other mustards, or at least vary from palate to palate. Thanks for the warning and the updated scientific name. I had C. draba etched into my mind and needed that info. I agree that it's going to vary from person to person and mustard to mustard whether this dish will be a success. I really prefer the L. draba for this dish, both because it is mild and meaty in texture, but realize not everyone has it. Pennycress has a much more pronounced garlic flavor (as you know, E), which makes me think it might be good mixed half and half here. Also, vinegar tends to temper bitter flavors a bit. Well wait, let me clarify: I didn't try the field pennycress in an exactly similar fashion. All I did was steam it. Want. Want. Want. Want. Want!!!! I recognize that one. Had no idea that it could be eaten. 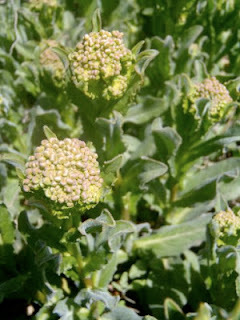 That's crazy awesome that there is something in the wild that is like broccoli. I loooove broccoli, but if I could pick something that is a weed and eat it, that would be so much cheaper. I think I found White Top here south of Dolores, CO. But I've never seen it grow over 10 inches high.